The Israeli Left is a one trick pony. As it sees things, all of Israel’s problems – with the Palestinians, with the Arab world, with Europe and with the American Left – can be solved by giving up Judea and Samaria and half of Jerusalem (along with Gaza which we gave up already). Once Israel does this, the Left insists, then the Palestinians, the Arab world, Europe and Bernie Sanders voters will love us as they’ve never loved us before. The events of the past quarter century have shown the Left’s position to be entirely wrong. Every time Israel has given the Palestinians land, it has become less secure. The Arabs have become more hostile. The West has become more hostile. The Palestinians have expanded their demands. Because of their negative experience with the Left’s policy, most Israelis reject it. This is why the Right keeps winning elections. Given the failure of its plan, the Left could have been expected to abandon it and strike out on a different course. But it didn’t. Instead it has tried to hide its continued allegiance to its failed withdrawal strategy by pretending it is something else. A central component of the Left’s concealment strategy is its use of former generals. Over the past quarter century, and particularly since the Palestinians began demonstrating in 2000 that they have no interest in a state living side by side with Israel, the Left has carted out retired generals at regular intervals to proclaim that continued allegiance to the Left’s failed policy of withdrawal is not irrational. Every couple of years, a new initiative of former generals – often funded by the EU – is published. Each in turn uses whatever the popular memes of the day may be to repackage their call for withdrawal from Judea and Samaria and the partition of Jerusalem. The media, itself dominated by the Left, backs these initiatives. The retired war heroes are paraded before the cameras and presented to the public as responsible adults who have grudgingly entered the political fray, despite their aversion to it, because of their patriotism. Just as they heeded the call of duty and led forces in wars of earlier generations, so today, we are told, they heed the call again, in yet another last-ditch effort to save the country. Just in time for Avigdor Liberman’s swearing in as defense minister, a new group of old generals released a new version of their old, discredited plan. 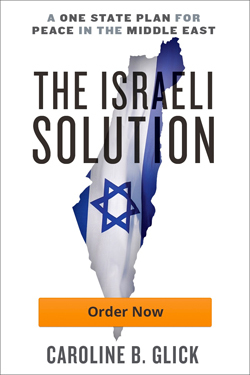 Their plan, the ad proclaims, will improve Israel’s security, strengthen its international position, repair the cleavages in Israeli society and set the conditions for future negotiations with the Palestinians. Unfortunately, like every leftist plan to date, if the generals get their way and the government takes their advice, the results will be precisely the opposite of what they promise. As has been the case with every other well-packaged withdrawal plan, Israel’s security will be harmed. Our international position will be wrecked. Bernie Sanders voters along with the Europeans will expand their devotion to bashing Israel. And the Sunni Arab states that now flock to us will again abandon us. The generals’ new package involves opening their plan with a hawkish call for continued Israeli security control over Judea and Samaria, until the Palestinians decide to make peace with us. But as we soon see, that was just throat clearing. Having established their sober-mindedness, the generals turn to the Left’s unchanging fantasy. They call for the government to formally relinquish Israel’s sovereign rights over the vast majority of Judea and Samaria and eastern Jerusalem. They call for the government to permanently stop respecting the property rights of Jews in the areas of Judea and Samaria outside of the security perimeter. The more than one hundred thousand Jews who live in those areas, they insist, must be denied all right to property, save the right to sell whatever they now own. They must not be allowed to build anything – no new houses; no new communities; no new infrastructure. As for the communities inside the perimeter, the generals insist that those should be permitted to continue respecting Jewish property rights, within limits, albeit. For instance, those communities must not be permitted to expand beyond their current construction boundaries. In other words, Jews can build up, but not out. Jerusalem, which they believe should never have been unified in 1967, should be effectively partitioned. The generals call for the municipal government to stop administering the city as a unified mixed Jewish and Arab city. Instead, they say, the city should set up a separate governing authority for Arab neighborhoods in eastern, northern and southern Jerusalem. That separate authority should be responsible for all planning and zoning activities in Arab neighborhoods as well as the education system and every other aspect of the daily lives of the Arabs of the city. Gaza, which has been operating as a Hamas state since 2007, is also brought in from the cold. The generals call for the government to continue to supply Gaza with everything that Hamas demands – water, electricity, employment in Israel, a Hamas-controlled port. They even call for Israel to allow Europe to pay the salaries of Hamas terrorists. Moreover, the generals recommend that the government announce that Gaza, Judea and Samaria and partitioned Jerusalem are one political entity, despite the fact that they aren’t. The generals insist that by taking these steps, Israel will prove its devotion to peace and keep the dream of a Palestinian state alive. As a consequence, they say, the Palestinians will be happy and stop trying to murder Israelis. The Arab world will line up to sign peace treaties with Israel. Europe along with Bernie Sanders’ voters will bury the hatchet and embrace Israel. The problem with the generals’ newest plan and the ones its replaces is that they all ignore basic facts. There is no Palestinian constituency for peace with Israel. The more Israel offers the Palestinians, the less interested they are in settling. By announcing that Israel renounces its claims to Judea, Samaria and Jerusalem, and treating the Jews east of the 1949 cease-fire lines as second class citizens, the generals will not only widen Israel’s social cleavages. They will tell the Palestinians that they are right to feel contempt for us. The worse they behave, the more we will offer them. The more Jews they murder, the more the Jews will turn against one another. As for improving Israel’s international position, it is hard to understand why the generals refuse to learn the lessons of the Gaza withdrawal. Despite the fact that Israel uprooted 24 Jewish communities in Gaza and northern Samaria, and removed its military forces from the area, without exception, the international community insists that Israel still “occupies” Gaza. How can the generals expect the world to act more fairly towards a more limited withdrawal plan from Judea and Samaria and Jerusalem? As for Gaza, Operation Protective Edge brought out into the open the fact that Egypt, Saudi Arabia, the UAE and other Arab states support Israel in its war against Hamas. They do so because they fear Islamic State and Iran more than they hate Israel, whose power they trust. If Israel announces its intention of leaving Judea and Samaria, which the Arabs know will become a Hamas enclave faster than Gaza did, the Arab faith in Israel’s power will diminish. As a consequence, if Israel follows the generals’ advice our relations with the Sunnis will worsen, not improve. It is a tragedy for Israel that the generals have allowed the Left to use them in this way. Their role in perpetuating Israel’s destructive adherence to the devastating two-state policy model diminishes their past contributions and endangers Israel’s future.